An outbreak of measles in the Williamsburg, Brooklyn area has led to 285 reported cases of measles since September of last year, and now officials are taking emergency action to prevent the outbreak’s spread. On April 9 the de Blasio administration declared a public health emergency, saying that of the 285 cases, 246 were children and that the time to act was now to prevent further cases. Since September 21 people have been hospitalized and five have been admitted to intensive care. So far there have not been any fatalities, and the administration is keen to keep it that way. Despite concerted education efforts since last September, MMR vaccine uptake has not reached the levels needed to get the outbreak is under control. The public health emergency includes an uncompromising message: Unvaccinated people living in affected ZIP codes who could have been exposed to the virus must now receive the MMR vaccine. Dr. Barbot appears to be referring to the circulation of a book known as PEACH (Parents Educating and Advocating for Children’s Health) which has been passed between Jewish families and contains extreme misinformation regarding vaccine safety. This a major contributing factor to for the measles outbreak in the area. The emergency declaration is the latest in a series of steps designed to protect the general public. Since December the Health Department has mandated that unvaccinated students in the affected areas schools be excluded, or the schools may face closure. The NYC health department has also targeted yeshivas and daycare programs that serve the Orthodox Jewish community to ensure that they are aware of the crisis and are getting vaccinated. In February of this year the health department also directed physicians serving the Orthodox Jewish community to offer an extra dose of the MMR vaccine for children between six months and 11 months in the Williamsburg and Borough Park area. This early dose would give children an extra layer of protection during this precarious time. 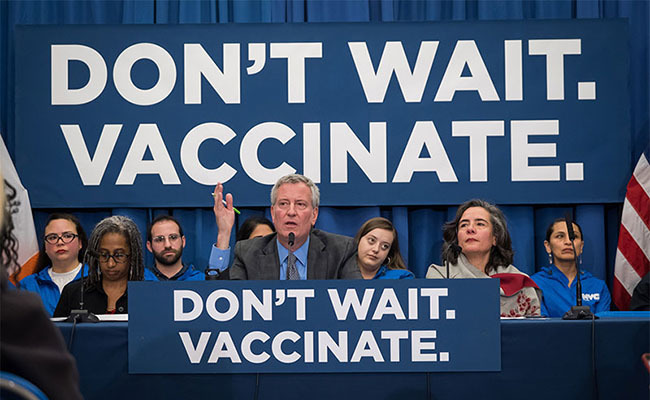 While this may all seem reasonable, there are those who are not happy—particularly with Mayor de Blasio rescinding religious exemptions to vaccinations in the Williamsburg area. As has happened elsewhere in the country, people are now threatening legal action for what they say is unconstitutional targeting of religious people. In this case, lawyers working on the suit also contend that the state of emergency declaration is premature and that the threshold has not been met to constitute such action, making the mandatory MMR vaccine order unlawful. However, officials have brushed off these threats, saying that there is legal precedent for limited mandatory vaccine orders and, to be clear, no one will or can physically force parents to vaccinate their children. They can continue to opt-out, but there will be monetary and legal ramifications for doing so. It’s also worth noting that the anti-vaccine movement among the Orthodox community is very much in the minority. Jewish teachings make clear that following the best medical advice on things like vaccinations is paramount and that while there may be some religious ethical considerations surrounding vaccines (the historic use of fetal cell lines, for example), this is secondary to the present threat to children. This case may create the showdown that anti-vaccine groups have been looking for, so they can try to find legal footing to block mandatory vaccine orders. In the meantime, New York City’s health officials are doing their best to prevent children from catching measles—a dangerous, potentially deadly, but preventable disease. Anti-vaxers are becoming a real danger to our children, and some adult. The Vaccine is SAFE, and saves thousands of lives. The anti-vaxers have had their minds poisoned with so many lies. I heard one state was thinking about passing a $2000 fine for not vaccinating their childern. As I've said before, anti-vaxxers are probably people who never had a sibling die of measles, ironically thanks to vaccines. My brother died as a baby from complications of measles, I was lucky in that I caught it at school when I was 5, so older and more resistant. Don't play Russian roulette with your children's health or other people's. Get vaccinated. If you're suspicious of MMR, just get the measles one, or space them out. If kids don't get all the vaccines at once I don't see a problem, but then again, I don't have kids. When it comes to public health, the public health authorities have the right to do what they need to do to protect the health of the community they serve. I've only had 1 vaccine in my whole life, and it was for polio when I was very young; I had no choice of course,, just like these children here.. - Education is key as to vaccinate or not.. I wonder as you spew your "Nazi" rhetoric if YOU were immunized as a child BEFORE starting school ? Your comments are irresponsible , thoughtless and dangerous. When my sons entered kindergarten in the 70's they were not allowed, no child was, to enroll without proof their vaccinations were up to date. This whole idea that vaccinations are dangerous is ridiculous. Religion has no place in medicine. Parental prejudices aren't allowed to place children in harm in any other way, there is no reason this should be different. Public health, public good comes before religion in this nation and most of the world. If it didn't, polio, smallpox and many other diseases would still be killing most of us. A parent has the right to refuse to accept a vaccination for him/herself, but not to stand in the way of the public good or their own children's health. They just don't. To all those with religious beliefs that say they are not allowed to vaccinate their children and so put them at risk I suggest you ask God to confirm this is really his will. If he doesn't reply in a loud booming voice coming from a burning bush you can take it he wants you to protect your child. His silence is just exasperation at your stupidity.